Cousin of Jesus. Brother of Saint Jude Thaddeus. Raised is a Jewish home of the time with all the training in Scripture and Law that was part of that life. Convert. One of the Twelve Apostles. One of the first to have visions of the risen Christ. First Bishop of Jerusalem. Met with Saint Paul the Apostle to work out Paul's plans for evangelization. Supported the position that Gentile converts did not have to obey all Jewish religious law, though he continued to observe it himself as part of his heritage, may have been a vegetarian. A just and apostolic man known for his prayer life and devotion to the poor. Martyr. Having been beaten to death, a club almost immediately became his symbol. This led to his patronage of fullers and pharmacists, both of whom use clubs in their professions. He is reported to have spent so much time in prayer that his knees thickened, and looked like a camel's. Soon after the Crucifixion, James said he would fast until Christ returned; the resurrected Jesus appeared to him, and fixed a meal for James Himself. Disciple of Saint John the Baptist. Convert. One of the Twelve Apostle. 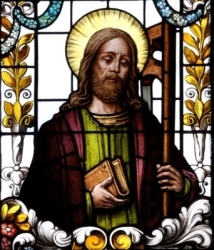 Brought Saint Nathanael to Christ. Confidant of Jesus. Little is known about him, but scriptural episodes give the impression of a shy, naive, but practical individual. Preached in Greece and Asia Minor. Martyr. Count of Brabant. Married to Hilsondis; father of one daughter; after the girl's birth, Ansfrid and Hilsondis, lived as brother and sister. Courtier and knight in the service of Holy Roman Emperor Otto III and Saint Henry II. After many years of this life he realized a call to religious life, and in 974 he gave up his life as a soldier. In 992 he founded a convent at Thorn, Netherlands, which his wife and daughter entered; his daughter eventually became abbess. He founded a Benedictine monastery at Heiligenberg, Germany, and planned to enter it as a monk, but in 994, in the face of local opposition, he was named bishop of Utrecht, Netherlands by Otto. Late in life his eyesight began to fail, and by 1006 he was blind; though he kept the title of bishop, he was finally able to retire to the Heiligenberg abbey where he spent his remaining days as a prayerful monk. There is a single church dedicated to Saint Ansfrid; it is located in Amersfoort, Netherlands. Four of seven daughters born to the wealthy Ghibelline patrician family of Pietro Bicchieri. Emilia was well educated, and early on showed a she was drawn to religious life, withdrawing to her room for hours of prayer. Her mother died when Emilia was still a girl, and her father became even more protective, and initially objected to Emilia becoming a nun. He eventually realized her true calling, and funded the construction of the Dominican monastery of Santa Margherita in Vercelli, Italy. Emilia entered the abbey as a Dominican nun at age 18. She was repeatedly chosen to serve as prioress of the house, but repeatedly refused and concentrated on menial domestic service to her sisters. She finally became prioress in 1273. She always had, and always promoted, devotion to the Eurcharist, the Passion, and Blessed Virgin Mary. Raised in a pious family, the son of Maciej and Jadwiga Soltys, he received a good education in the faith. Received doctorates in theology and philosophy from Jagiello University, Kraków, Poland. Entered the Canons Regular of the Lateran in 1456, devoting his life to the Eucharist and to the care of the sick and the poor, and taking the name Stanislas Kazimierczyk. Priest, noted as a great preacher and popular confessor. Prior and novice master at his monastery. Professor of philosophy and theology. Friend of Saint John of Kanty. Like many holy people, the people who knew him considered him a living saint while Father Stanislas saw his own life as a constant struggle for holiness. Born to a poor family, the boy worked as a shepherd in his youth and received no schooling at all. Joined the Capuchin Friars Minor on 12 September 1580 at Verona, Italy where at age 17 he finally learned to read and write. Tommaso made his final profession on 5 July 1584 and served as a clerk in convents in Verona, Vicenza, and Rovereto until 1617. Outside the convent he visited the sick, helped the poor, and encouraged a love of the faith to anyone who would listen. When Lutheranism began to make inroads in the area, Tommaso spoke and wrote in defense of the Church; he didn't confront, he didn't preach blood and thunder, he simply spoke on his love 'the impassioned Christ' and the Church he founded - and it was persuasive. Son of Peter and Anastasia Gowdel who were pious Orthodox Christians. Gabriel was noted for his piety and prayer from a very early age. He was a murder victim, and was considered a martyr. His attacker buried the body in a wooded area near the village where stray dogs guarded it until it was discovered by the villagers nine days after the crime; the body was incorrupt. During an epidemic in 1720, children were buried near him, their families considering the ground around a martyr to be especially hallowed. His body was accidentally exhumed, and found to be incorrupt. There were many miraculous cures after the incident, and the end of the epidemic followed soon after. Skilled worker in gold and silver, and manuscript illuminator. Hermit in a cell in Old Connell, Ireland near the Liffey river. His reputation for holiness attracted would-be disciples. Friend of and co-worker with Saint Brigid; they ran first double monastery together. First bishop of Kildare, Ireland c.490. 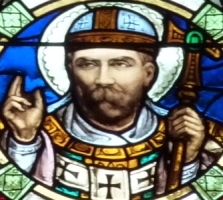 Baptised Saint Tigernach of Clogher. Died while on pilgrimage to Rome, Italy. Roman citizen. Pope in the reign of Emperor Trajan. 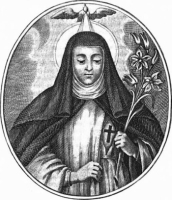 Baptized Saint Balbina of Rome. He inserted in the Canon of the Mass the words commemorative of the institution of the Eucharist beginning "Qui pridie". Introduced the use of blessing water mixed with salt for the purification of Christian homes from evil influences. Martyr. While in prison awaiting execution, he converted the criminals who became the Martyrs of Ostia. Born to a poor but pious family. Educated by the Sisters of Notre Dame. Joined the Marianite Sisters of the Congregation of the Holy Cross on 21 February 1854, taking her final vows in 1857. Taught in Montreal, in New York, and in Indiana. With 14 of her sisters, she founded the Poor Sisters of the Holy Family, devoted to assisting priests and seminarians, at Memramcook, Nebraska in 1877. Ordained by Pope Saint Damasus I. First bishop of Narni, Italy in 368. Legend says that he saved Narni from invasion by Ligurians and Sarmatians praying for a great thunderstorm so great that the invaders fled in fear. Another story says that there was an attempt on his life by trying to strike him in the head with a sword; Juvenal caught the blade in his teeth and the would-be killer gave up. Lay woman. Married to Saint Timothy of Antinoe. About twenty days into the marriage, and in the middle of the persecution of Diocletian, Timothy was arrested. As he was being tortured to learn the location of sacred texts, Maura was dragged to the prison; the authorities thought that if they threatened to torture her, Timothy would break. Timothy refused to talk, and Maura made a profession of her faith. Enraged at their defiance, Arrianos, governor of Thebias, ordered her tortured. Witnesses begged that the tormentors release the innocent woman, but she told them that God was all the protection she needed. Martyred with Saint Timothy. Layman son of a priest named Pikolpossos. Lector and copyist, he was responsible for the security of the liturgical texts used in services. Married to Saint Maura of Antinoe. About twenty days into the marriage, and in the middle of the persecution of Diocletian, Timothy was arrested. Dragged before Arrianos, governor of Thebias, he was ordered to surrender any Scripture writings he had hidden; he refused. Horribly tortured, including being burned, hung upside down, and having his eyelids cut off; he still refused. Martyred with Maura. Priest. Member of the Sons of the Holy Family; worked as secretary for his Institute. Publisher of their magazine. Wrote the first biography of Saint Josep Manyanet-y-Vives. Catechist and spiritual director for young people, working closely with those with a call to religious life. Promoted devotion to the Holy Family as a way for families to stay together. Arrested on 19 April 1937 by anti-Church forces. One of the Martyrs of the Spanish Civil War. Ordained in 1854 at Nice, France. Worked in prison ministry. Wrote a catechism. Founded a home for abused and abandoned children in 1856. Founded the Sisters of the Third Order of Saint Francis of Susa. Bishop of Susa, Italy on 24 February 1878. Raised as a Muslim in 17th-century Constantinople. Calligrapher and copyist in the royal chancery. He lived as an unmarried layman, but had a concubine, a Christian slave woman from Russia. Little by little, she brought him to a desire for the faith, and he began his catechumenate. However, before he could be baptized he was betrayed by another calligrapher who spotted him with Christian. Ahmed was arrested, imprisoned without food for a week, and then murdered for his desire to convert. Martyr. Raised in a pious family; his brother Ethelwine was the second bishop of Lindsey, England, and his sister Ethelhild was abbess in Lincolnshire, England. Founded the monastery Athelney in Somerset, England. Monk. Abbot of Peartney in Lincolnshire, England. 11th century monk and hermit who rebuilt churches in Cantalupo in Sabina, Italy that had been destroyed by invading Saracens. Miracle worker. 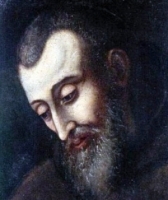 Franciscan, accepted into the Order in Rome, Italy by Saint Francis of Assisi. Sent to Spain by Saint Francis to preach Christianity to the Moors. Used miracles to prove the Real Presence. Soldier in the imperial Roman army. In the persecutions of Maximian, he changed clothes and places with Saint Antonina of Constantinople after she had been condemned to live as a prostitute. They were discovered, tortured, their hands cut off, and killed. Martyr. Consecrated virgin. In the persecutions of Maximian, she changed clothes and places with Saint Alexander of Constantinople after she had been condemned to live as a prostitute. They were discovered, tortured, their hands cut off, and killed. Martyr. Eighth century monk at Ripon Abbey. Hermit on Farne Island for 12 years. Friend of Saint Egbert. Bishop of Lindsey, England. Late in life he retired to religious life in Ireland. Priest in Rome, Italy. Imprisoned, tortured and martyred with Saint Theodulus of Rome and Saint Eventius of Rome. Priest in Rome, Italy. Imprisoned, tortured and martyred with Saint Alexander of Rome and Saint Eventius of Rome. Priest in Rome, Italy. Imprisoned, tortured and martyred with Saint Theodulus of Rome and Saint Alexander of Rome. Anglo-Saxon pilgrim. Hermit near Worms, Germany. Friend of and advisor to King Pepin the Short. Founded the monastery of Zell, Germany around which grew the town of the same name. Born to a royal Scottish family; brother of Blessed Mechthild. Cistercian monk at Foigny monastery, diocese of Laon, France. Sister of Saint Waldalenus. Abbess of a convent near Bèze under the supervision of her brother. Franciscan priest. Confessor to Pope John XXII. Bishop of Nocera, Umbria, Italy. Spiritual student in Ireland of Saint Columba of Iona. Zealous missionary. First Christian missionary in Banffshire, Scotland. A healing well there is named for him. Bishop in Argos, Greece; known for his ministery to the poor and slaves, and as a peacemaker. I have no information on this saint's life. I have no information on this saint.